The 10.10.3 release of Yosemite fixed most of its “Attack of the 50 foot save sheet” issues, but a few remain. Specifically, in Photoshop and Illustrator there are still dialogs that grow larger each time you use them. Version 4.7.2 of Default Folder X fixes these problems. 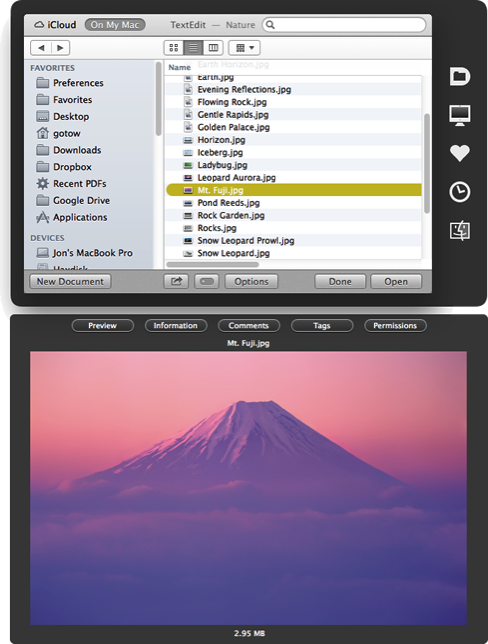 Version 4.7.2 also adds additional safeguards to keep Default Folder X from hanging when it encounters damaged alias files, fixes some graphical glitches, and addresses a number of bugs and compatibility issues. A full list of changes is available on the Default Folder X Release Page, along with links to download installers in English, German, French, Danish and Japanese. Because Default Folder X 4.7.2 includes a fix for possible freezes when it encounters bad alias files, we recommend that anyone who’s using Default Folder X upgrade to this version. Download your copy now! Public beta of Jettison 1.5 – new and improved! After a lot of restructuring, debugging, testing and wrangling with various types of disks, Jettison 1.5 is close to finished. It handles ejecting and remounting more smoothly, and includes a workaround for situations where the old version failed to eject drives at sleep time because the screen was locked. Once you’ve installed it, drop me an email at jettison@stclairsoft.com to let me know you’re testing it, then send any issues or questions to the same address if you encounter anything.